It’s time to celebrate all that is St. Patrick’s Day. 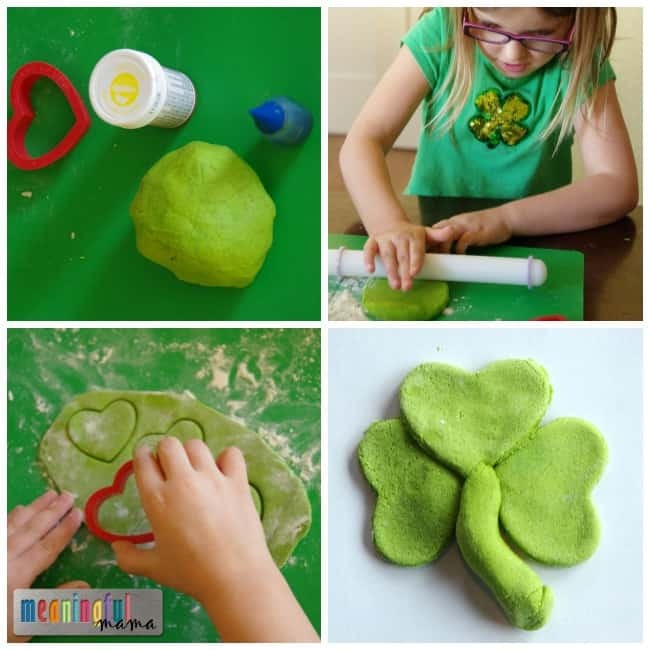 If you are looking for a fun craft for your kids this year, I think you’d all enjoy this simple St. Patrick’s Day salt dough clover craft. After all, clovers are one of the big symbols for this very green day. 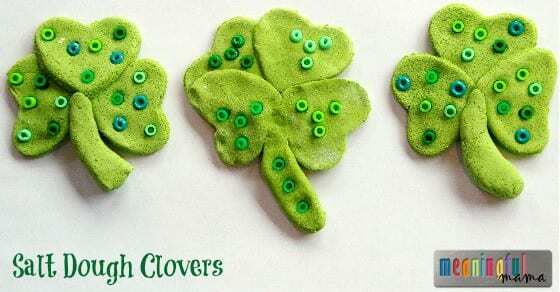 Other crafts you might enjoy include my four leaf clover paper craft or the simplified version. If you are looking for fun food ideas, you’ll definitely want to check out this post. We love doing salt dough crafts. Have you seen our salt dough fingerprint flowers or our fall salt dough ornaments? We have made things for Valentine’s using salt dough. 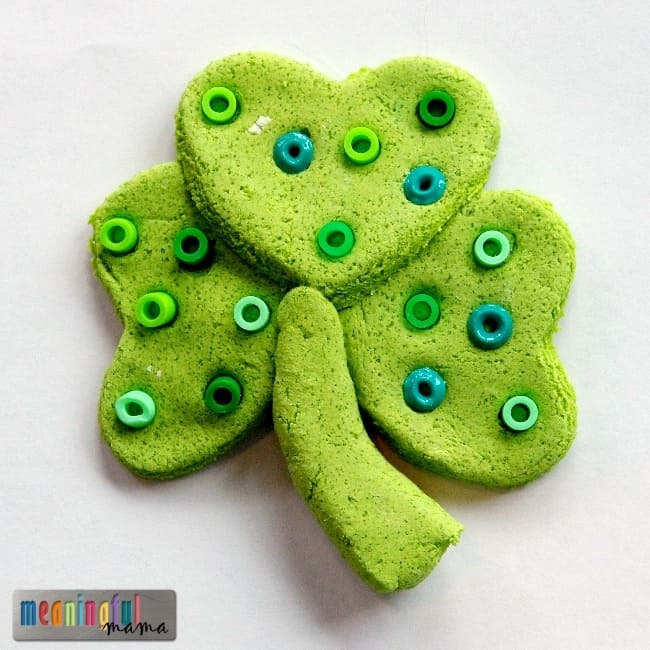 Why not try a St. Patrick’s Day craft too. This is a simple activity that will be a lot of fun for your kids. Rolling Pin – I like the one I link to here. I do cakes, and it’s great for determining thicknesses of fondant, gum paste or pastry. It’s the perfect size for kids to easily use too. 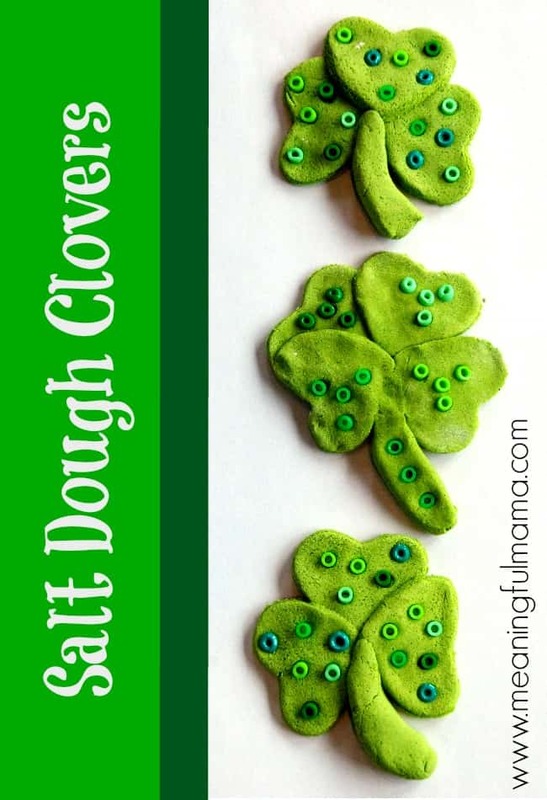 Make a batch of salt dough and use the food coloring to color it green. Have the kids roll out the salt dough to 1/4″ thickness. Using a heart cookie cutter, cut out hearts out of the green salt dough. You can make 3 or 4 leaf clovers. Roll a snake with your hands to create the stem. Put the hearts and the stem together, pressing at connecting points to create a clover. Take different shades of green plastic perler beads and press it into the dough to create a polka dot effect. Bake at 250 for 2-3 hours, keeping your eye to make sure they don’t get overly browned. Bake on a silicone baking mat or parchment paper placed on cookie sheet. I hope you have fun making these. You could also (before you bake) use a straw to puke a hole at the top. Kids might want to make them into a necklace or string them to make a garland for decoration. Happy St. Patrick’s Day!